There are only a few pictures in this post. Go here if you just want to see all of the pictures for Bulgaria and heading home summer 2015. Warning: there are a lot of churches in this batch of photos. But don’t miss the bears. We crossed into Bulgaria on the morning of Tuesday 11 August, over mountain roads from Xanthi in Greece. The scenery stayed much the same in the mountains with twisty roads and a nice place for a lunch stop. Most of the road signs, when they existed, had the place names in Roman letters as well as Cyrillic. 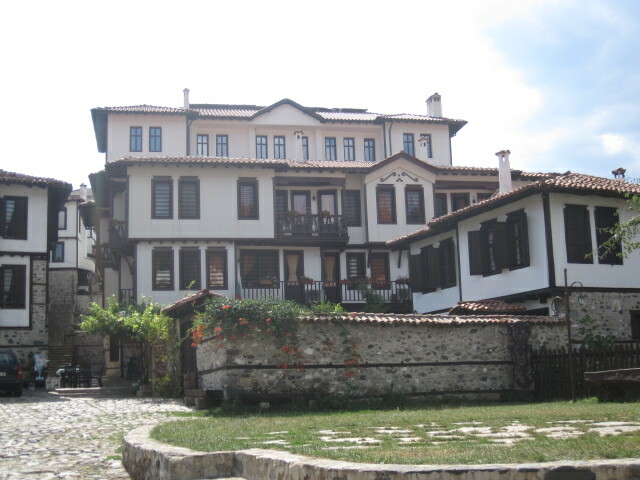 The first town in Bulgaria was Zlatograd, down from the mountains. We had no trouble in getting Bulgarian leva from an ATM and then had a brief walk round the area called the Ethnographic Area Complex where there are several interesting old houses. 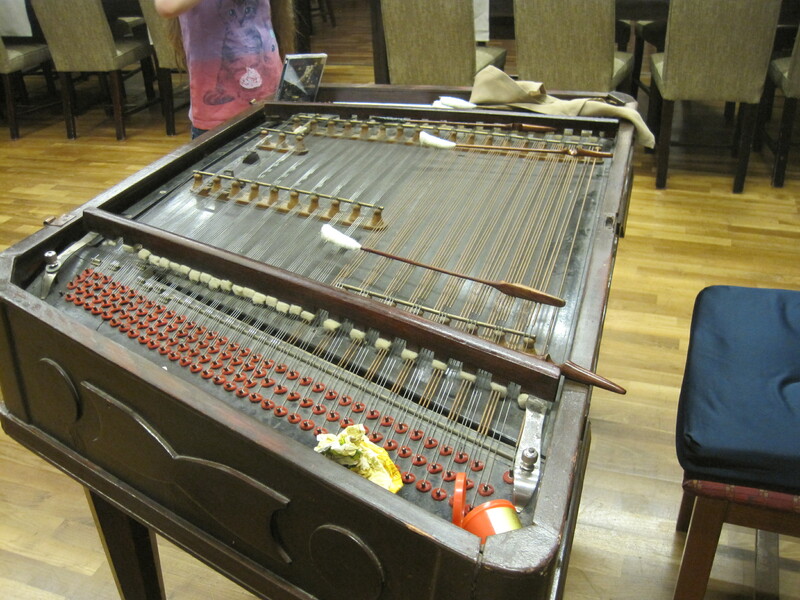 A lady was demonstrating weaving on a huge loom in one house, but there wasn’t a lot to see in the museum. We had booked a small hotel called Friends Villa (in English) for the night in a village called Enquets not far outside the town of Kardzhali which was rather drab. Finding the road out of Kardzali was interesting as there weren’t any signs, but eventually we got on to the right road. The hotel was pleasantly new. The room very nice and the owner spoke good English. We seemed to be the only people staying there. The dinner menu was sort of OK. When we sat down to eat we remembered the lovely salad we had when we went to Bulgaria before. It’s called shopska and consists of chopped cucumber, tomato and sometimes green peppers and onions, topped with grated cheese. The cheese is called sirene and is a rather like feta but not as sharp. We liked it so much that we bought some to bring home. When we went down to breakfast the next morning, we discovered that the owner had gone out leaving a lady in charge who didn’t speak any English. We managed to get some food, but she did not know how to use the credit card machine which had run out of paper. However we were glad we had decided not to stay in any of the hotels in Kardzhali which would almost certainly have meant parking on the street. 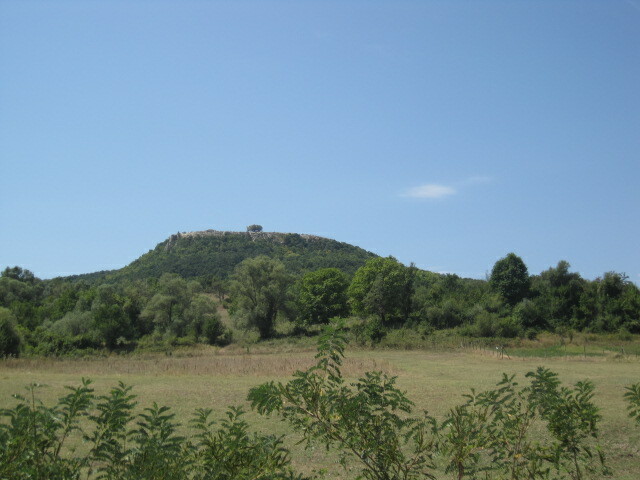 Our reason for stopping in this area was to visit Perperikon, a spectacular archaeological site on the top of a hill. It was here that Alexander the Great received the prophecy that he would conquer the world. We managed to find Perperikon without any problem only to discover that we had to park near the bottom of the hill and walk up in 35C with not much shade The path up was paved and not at all difficult. When we got near the top most people were turning off up a lot of steps, but we decided to carry on along the path which now became narrower and went through a nice forest. We got to the top in about 40 minutes hearing more and more noise. We found a large number of people working on an archaeological dig and some of the site was roped off. The view was spectacular and we were able to see most of it. It was well worth the walk up in the heat. Martin walked down the steps but I preferred the forest trail. There were plenty of tourists at Perperikon but hardly any others from the west. 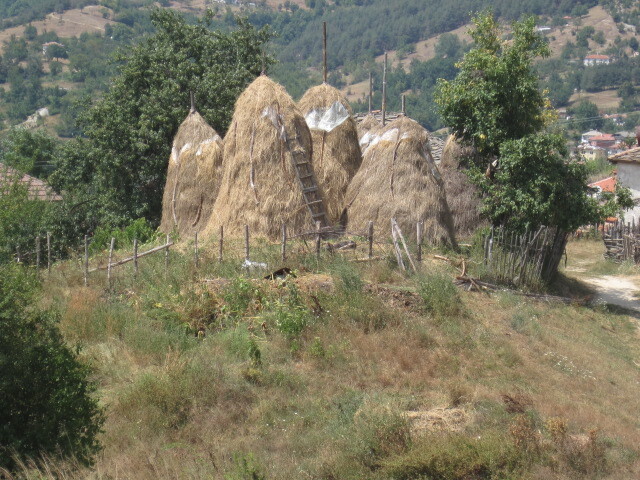 We drove back to Kardzhali and then headed west through more farmland, villages and lower mountains. All the houses had red roofs sloping at the same angle. Cows were wandering around on the main road. We had a lunch picnic at a table near some traditional haystacks. We had not made any arrangements for accommodation for our second night in Bulgaria, and decided to go to Pamporovo which is a ski resort. Ski resorts are usually very quiet out of season and you can get a good deal in the few hotels that are open. The guidebook recommended one very tall hotel which had balconies overlooking a wooded ravine. It was open and we were first offered a room with no view. When we said we would look elsewhere the manager appeared and told the receptionist to take us to another room which turned out to be an apartment with a good view, for very little more money. There were several other people staying there and dinner and breakfast weren’t at all bad. 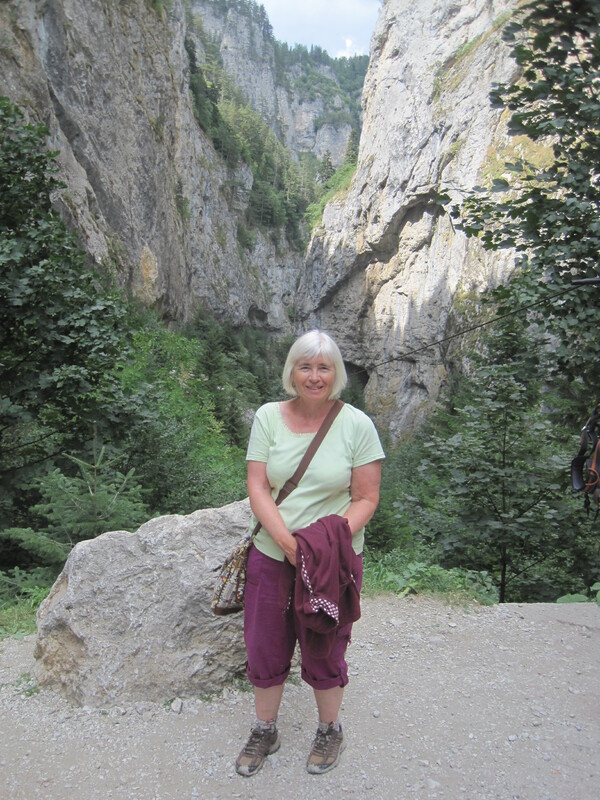 Next on our sightseeing agenda was the Trigrad Gorge, where the road was very narrow, but fortunately in the bottom of the gorge, not on a narrow ledge. We passed the first of several mosques we saw in Bulgaria on the way there. The main sight in the gorge is a cave called, for a good reason, the Devil’s Throat. There is a deep waterfall inside the cave and nobody knows exactly where the water goes underground. People have put objects down it and they come out at the other end after about 4 hours. You have to take a tour and so we joined a large group. The guide spoke some English, but the most of what he said was in Bulgarian. We soon discovered that the Bulgarians have rather different ideas about cave safety than the Italians. The steps were narrow and rather steep and the handrails rather thin. We had to walk some way down and did just see the waterfall. Coming back out was worse. It was a different route and at one stage there were over 100 steep steps going up. I found it better to wait a bit and then take a run at the steps, but we were behind an old lady who was very slow. If anyone had slipped, I think everyone could have fallen back like dominoes to the bottom. Perhaps one cave was enough in Bulgaria. After recovering a bit, we drove through the gorge to the end and found ourselves in a nice valley with farmland and just a few houses. We had to come back the same way and then went some way into another gorge nearby with the the same kind of narrow roads and scenery. We spent the night at Dospat, just turning up at a hotel recommended by the guide book. The restaurant was on a lovely terrace overlooking a reservoir. Plenty of locals were eating there and we could park just off the road. After leaving Dospat we headed north on more twisty roads, dodging more cows and staying well behind a small truck which was very overloaded with hay bales. The scenery was still quite mountainous and it rained just a bit. We had to eat our lunch in the car and were passed by some Roma in a horse and cart. Our destination was the Dancing Bear Rescue Park at Belitsa, but it’s not actually in Belitsa but almost 20km further up into the mountains. The guidebook said that the road to it was not good, but we thought we would try it and found it newly paved, although still narrow. The last 3-4km were gravel but not much different from some forest roads in the US. Dancing bears were finally banned in Bulgaria when they joined the EU. The centre has over 20 bears, which are housed in huge enclosures and very well looked after. It is funded partly by the Brigitte Bardot Foundation. We were met by a very nice Bulgarian girl who spoke fluent American. She told us a lot about the centre. There was also good video showing how badly the bears were treated and what had been done to them to make them perform. There’s a good path round the outside of some of the enclosures and we did the entire walk round. Some of the bears had bad or no teeth and one was very restless pacing up and down all the time. It was very sad to learn what had happened to the bears in the past but they are very well looked after now. Our next night was spent at Hotel Park Bachinovo just outside Blagoevgrad which is one of the larger towns in Bulgaria. We didn’t want to stay in the town but had to find our way through it to go to the hotel which was on the edge of a national park. This was a nice modern hotel rather like an upmarket American motel room (but much cheaper). We had a lovely room with good wifi. Dinner was not so good. The restaurant was outside and we were told that it was almost all booked – it was a Friday. We were taken to a table at one side. A very large number of Macedonians arrived for dinner and there was some music. We couldn’t see much of the entertainment from where we were. The service was really bad. It took a long time to get any food at all and then bits of our meal arrived in random order and not at the same time. Breakfast was not wonderful either, but at least it was quiet as none of the Macedonians were staying there. 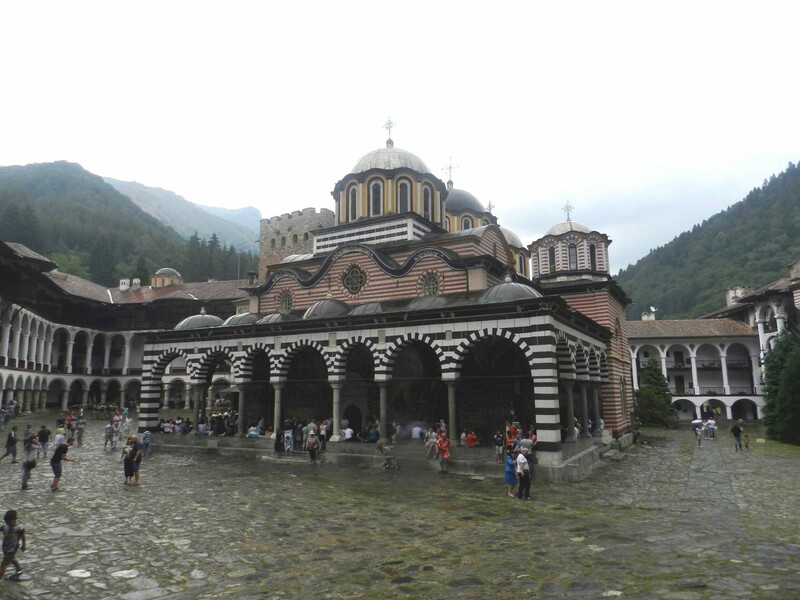 We went back to Blagoevgrad and then drove up the main road and turned off for the Rila Monastery which is probably the best known tourist attraction in Bulgaria. The drive to it is about 30 minutes along and slightly up a valley. When we got near we saw that there were a lot of people there. The monastery has only a very small car park and most people were parked along the side of the road. We carried on past the monastery and parked about 1km from it and so had to walk back. It was very crowded indeed and we finally found out that it was a public holiday in Bulgaria (Saturday 15 August). It also began to drizzle with rain a bit. However it was well worth going as the whole monastery complex is quite spectacular. The paintings on the wall and ceiling outside the church were amazing. It would have taken hours to study them all in detail. Most of the people there seemed to be eating doughnuts with chocolate for lunch, or chips with some gloop on top, and the restaurants were busy. We finally found a space in one for lunch which was sort of OK. The weather brightened up and we had a pleasant drive back to the main road, stopping to buy a large painted dish on the way. We were then on the main road going north towards Sofia. When we got there we found that the ring road was mostly under construction with a dearth of road signs. We were heading for the village of Chiprovtsi where we had booked a small hotel. It was by a stream in the centre of the village. The owner spoke very good English and we had a huge room, more like an apartment. I think we were the only people staying there. Dinner was good. In the morning the owner asked if we would like to try what the Bulgarians usually have for breakfast. It was pieces of a kind of fried dough, a cross between a doughnut and a chapati, and quite light. We ate them with some cheese and home made jam and rather liked them. It certainly made a change from the usual buffet of cold meat, cheese, bread and jam, and cereal if we were lucky. 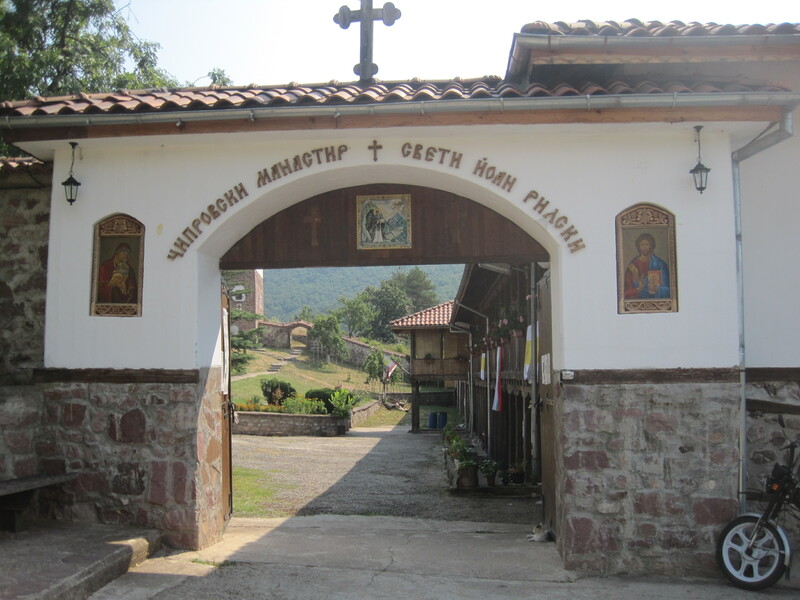 There is a small monastery just outside the village of Chiprovtsi which we liked a lot. It was very peaceful and they had a nice garden including some interesting cacti. It was a lovely day the next day when we drove northwards. We stopped to take a picture of a field of sunflowers, but it was late in the season and they weren’t as good as the spectacular ones we saw when we went to Bulgaria before. We also stopped to take some pictures of the hill-top fortress at Belogradchik, but didn’t go in as we had been there before. Our main objective on that day was to visit the Magura Cave. Did I say cave again? Perhaps we should have learnt something from the Devil’s Throat Cave. There is a short walk from the car park up to the entrance and we arrived just before a tour was starting. Nobody spoke English at the ticket office but Martin managed to get two tickets. The guide didn’t speak English either and so we had little idea what to expect. 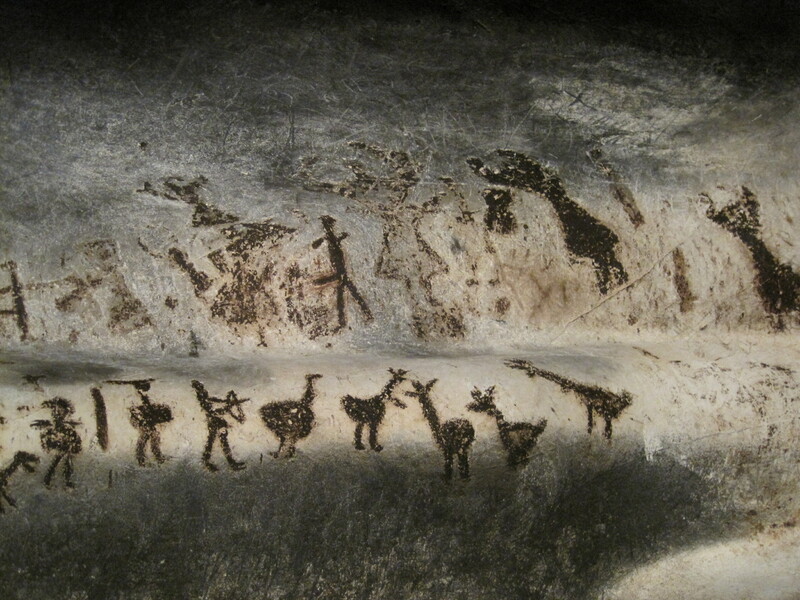 The guidebook said that the cave contained some prehistoric paintings which was what we wanted to see. We had to walk down quite a long way inside and it was very slippery indeed, with a rather feeble handrail. There was a level area at the bottom of a lot of steps and we found out that the tour went very much further down. I really decided that I had had enough by then as it was so slippery but Martin had gone on with the flow of people down further. A few people were left on the level area with another guide who spoke English. He told me that only this small group were going to see the paintings which were through a little tunnel from there. There was an extra fee for seeing the paintings. I didn’t have any Bulgarian money with me but he let me go along with them anyway. The paintings were excellent, but I also remembered that the ones in Lascaux in France were closed to the public to protect them. We were allowed to take as many photos as we liked and could walk right up to them. The guide explained quite a lot in English for my benefit. When we left the paintings it turned out that this small group was then going down to do the rest of the cave and that it would take about an hour. I asked the guide why they didn’t have more handrails and he said that they had no money. I decided not to go on and so climbed back up the slippery steps on my own, clutching on to the wall. I had been sitting outside the ticket office at the top for about 15 minutes when Martin appeared. The walk inside the cave was so far that visitors were brought back to the car park in an ancient trolley. What were our impressions of Bulgaria? There is some lovely mountain scenery. The roads are OK if you don’t mind a few potholes and can cope with the roadworks around Sofia. The food was OK – we really liked the shopska salad. A guidebook is a necessity if you want to get round on your own. It’s also very helpful to be able to read the Cyrillic alphabet for road signs etc. We saw a few British cars and came to the conclusion that they were either Brits living there or Bulgarians who had been working in England and had bought the cars and driven them home. The people are more reserved that the Greeks, but they were helpful. Most of the young people speak very good English. The Internet was very good everywhere we stayed. But don’t visit any caves! After the Magura Cave, we ended up having a very late lunch of shopska and bread rolls, and a conversation with a Greek truck driver who was waiting for a part for his broken down truck, in a small town on the way to the border with Romania. There is new bridge across the Danube near the border town of Vidin. When we got near it, there was a very long queue of trucks, but we followed some cars past the trucks and drove over the bridge and were soon in Romania. We quickly turned north off the main road into Romania. The scenery was much flatter and there was a lot of farmland. Occasionally we could see the Danube in the distance on our left. When we went to Romania in 2009 we stayed in a lot of small modern B&Bs and hotels and were expecting to find somewhere like this for the one night we planned to stay there. There was nothing until we came to the first big town Dobreta-Turnu Severin which is a rather drab industrial town on the Danube. We didn’t find anywhere we wanted to stay in there and so drove on along the side of the Danube. The guidebook mentioned several hotels in Baile Herculane which is just off the road northwards towards Timişoara. Time was getting on and it was starting to rain again. We turned off and drove some way on a twisty road through a valley where there did appear to be a lot of hotels – too many to choose from. There were also a lot of people about, presumably there to take the spa waters. The guidebook mentioned the Hotel Roman which turned out to be a 10-storey concrete building by the side of the river built on the site of the Roman baths. This was definitely a relic of the communist era with a dingy interior (lots of dark red carpet) and very boring or non-existent decor. The three ladies on the reception desk did not speak any English but pointed to a board with room prices. It was getting dark and drizzling with light rain and so we took a room on the 10th floor which was fairly small and could definitely do with a new bathroom. Not all the lifts were working either. The dining room was one huge space. There was a waiter who spoke English and we got a reasonable meal. We had planned to charge it to the room, but were told we couldn’t do that. We didn’t have any Romanian money on us and ended up paying 9 euros in cash for dinner for two. The room price included breakfast for which we were given a voucher of 30 lei (about 7 euros). Every item on the breakfast menu was priced individually including each bread roll, egg, pat of butter and small dish of jam. This was one of the very few places where breakfast was not a buffet. We had to pay for the entire stay in cash in euros, but it didn’t exactly break the bank. We found a better road back down the valley to the main road. We did not do any sighteeing in Romania but drove northwards to Timişoara where we filled up with diesel, and then turned westwards to Hungary. We crossed into Hungary near the town of Makό and went into the town to get some forints. Everywhere seemed cleaner and tidier than in Romania and Bulgaria. It looked more like Western Europe. We drove through Szeged and on to our first night’s stay in Hungary at a very nice hotel which was out in the country near the town of Lajosmizse. It was easy driving on the motorway (no potholes). The hotel had been a country house and extended to include some motel-like rooms which were very well furnished. Dinner was good and there was some entertainment, presumably because a big group was staying there. Four musicians played a variety of music, not just Hungarian. One of them was playing a string instrument, a bit like a zylophone with many strings. I found out later that it was a cimbalon. He even played it blindfolded at one stage. There were four dancers including two females who danced balancing a bottle-like object on their heads. It was good to see that the dancers were young and carrying on Hungarian traditions. The next day we drove the fairly short distance to Budapest on the motorway. We easily found a parking space at the bottom of the castle hill in Buda and walked up a lot of steps to the main tourist area. It was drizzling a bit as well, but not enough to stop us walking round. I saw that the area had been renovated since my last visit in 1998 and everything was clean, neat and tidy. We had to queue for some time to buy a ticket to go into St Matthias Church and the ticket selling could have been better organized. The interior of the church was quite different from those we had seen earlier and very ornate in a different way. We ate lunch in a restaurant on the Castle Hill and then it began to rain more heavily and so we headed back to the car and drove out northwards for our next night at Visegrád on the Danube where we had a room overlooking the river. There is a big fortress on a hill overlooking Visegrád. We drove up there the next morning in mist and rain and decided that it was not worth going in when we would not see anything of the view. 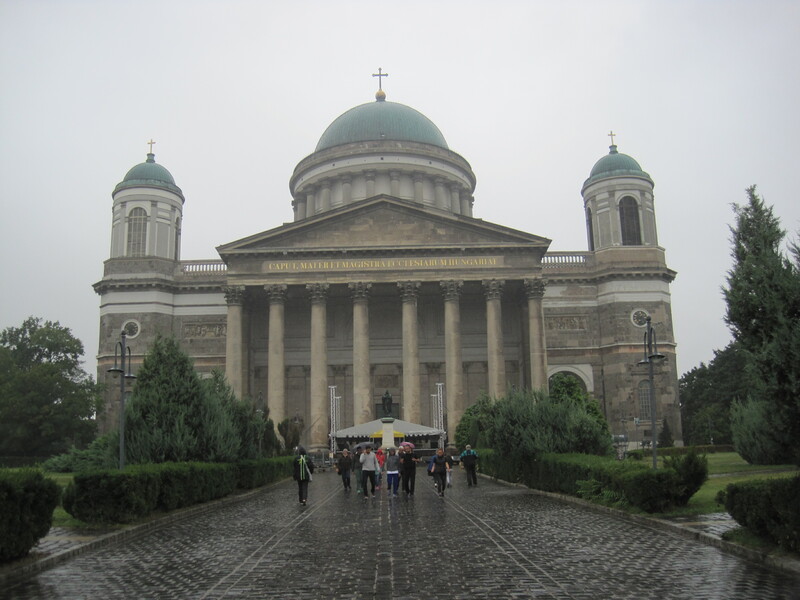 We did stop at Ezstergom on the Danube to see the Basilica which is the largest church in Hungary. It was enormous, too much to see in a lot of detail, but I really liked the metal friezes, especially the donkey. I took another photo of the Danube in misty rain. Then it was up the motorway to Vienna. The road east of Vienna was pretty bad with potholes etc and then we had to navigate through the evening rush hour to the parking garage we had identified as being the nearest to the old city for some quick sightseeing. It finally stopped raining not long before we arrived. First stop of course was a konditorei for a cake and coffee then we spent a couple of hours in the old town, visiting the cathedral where there are some amazing carvings of toads on the wooden handrail to the pulpit, and also just wandering round. It was very busy, but the traffic had eased off when we drove out about 7.30 pm to a small hotel in Gablitz, a short distance away in the Vienna Woods. We did a bit more sightseeing in Austria, first to Krems which is a very old town on the Danube which was almost as large as Vienna in the Middle Ages. The old town was on a hill. It was a steep climb up to the old church, through a covered tunnel of steps but well worth it to see some paintings on the outside. The main street was pedestrianised with nice shops and cafes. There was more interesting architecture in the old town and not many tourists. Then it was on to Melk to the huge abbey. I ducked out at that point for a rest but Martin went round most of it. There were plenty of visitors there as well. We had one night in the Czech Republic where we stayed in a B&B in Rožmberk on the banks of the Vltava. Dinner in a nearby hotel wasn’t wonderful but it was interesting to see yet another country and a different part from where we went in 2009. The town of Český Krumlov, about 30 minutes from Rožmberk, is one of the main tourist attractions in the Czech Republic and we ended up spending several hours there. 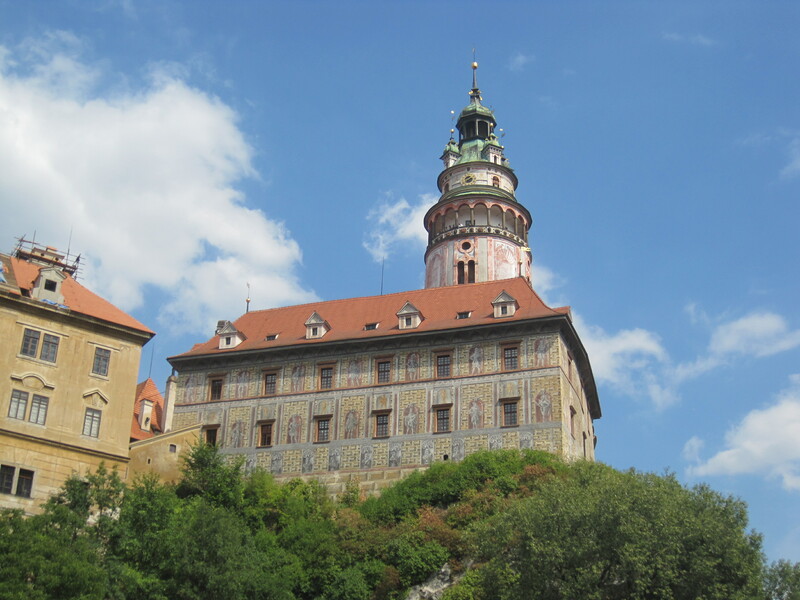 There is a huge castle complex on a rocky hill overlooking the Vltava. We did not go inside but walked round all the courtyards. There was a lot of exterior decoration and some of the walls were painted to look like they were made of large bricks. The castle actually straddles two hills or rocks and there is a high bridge between them which goes down several levels to the ground in between. 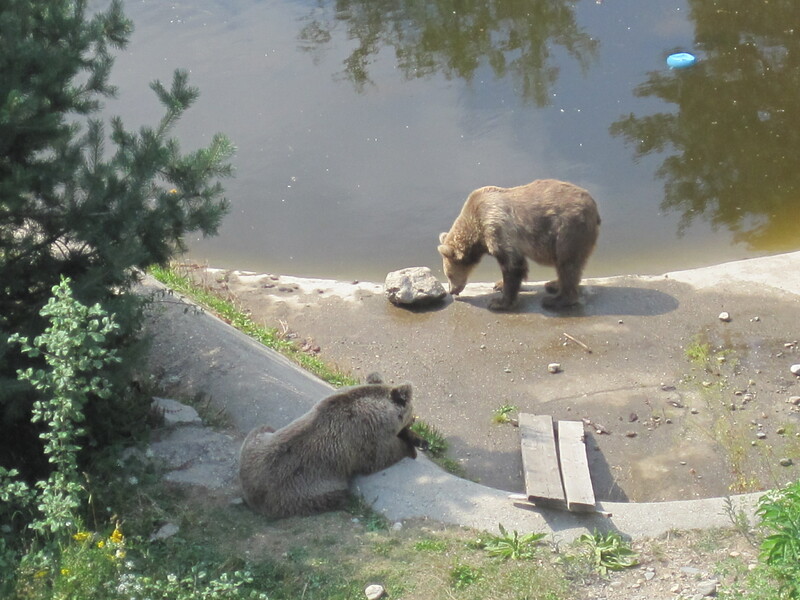 There is a moat (now dry) which was occupied by a rather miserable looking bear who was eating some fruit. I thought he would be better off at the Dancing Bear Park. Český Krumlov was very busy with tourists and there are plenty of restaurants. We had lunch outside in one overlooking the Vltava. We needed to do some shopping there and went to the German chain Kaufland. We did see a sign to Tesco which was further out but didn’t go to see what it was like. Then it was back to Austria on some small roads past a lake and through some lovely scenery, part of which is a national park in the Czech Republic. There were a lot of cyclists here. We had decided to spend two nights in the same place before setting off on the 1000 or so miles back home. We had settled on Gasthof Greiner near the village of Julbach and right on the border with Germany which was only about 5 metres away. This turned out to be an excellent choice. The food was very good indeed and we had a lovely and very typical Austrian view over a large green field. Our main activity on our full day there was a walk of almost 3 hours. It was lovely scenery. We ended up going further than we intended by missing a turning in the middle of a wood, but all turned out fine in the end. Martin did another walk later on this time in Germany. After all the recent goings on with migrants, I wonder what has happened to that border point now. The owner of the hotel told us that before the Schengen agreement, it used to be open for 4 hours a day. 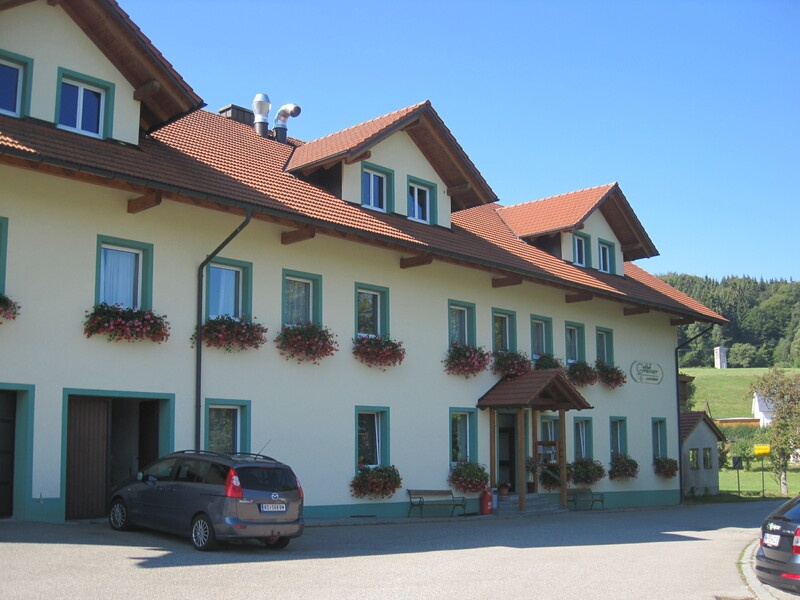 Gasthof Greiner, near Julbach, Austria. The yellow sign on the right is in Germany. Driving back through Germany was not without interest. We left on a Sunday and encountered the worst traffic jam we had found on our trip, where several motorways join around Nuremberg. I was driving and we managed only 27 miles in 1.5 hours and began to wonder what it would be like around Frankfurt, but there was hardly traffic at all when we got there in the late afternoon. It was fortunate that we hadn’t booked the hotel we had identified for that night as we would not have got there before dark. Instead we stopped at Limburg in a hotel just outside the old town. Dinner was a nice Turkish meal in a square in the old town. The next morning we spent an hour or so looking round there and found some curious metal sculptures attached to the outside of one house. The cathedral was huge. We didn’t stop long there but did find a stone tomb which was raised up and resting on some sculptures, two of which were of monkeys. After we left Limburg we just kept driving with little traffic even around the Brussels Ring until we reached Dunkirk where we went to the hypermarket to get cheese, pate and other goodies to take home, as well as filling up with diesel. We spent the last night at a logis de France in Bollezeele about 15 minutes from Dunkirk. The hotel was very elegant as was the food which was perhaps a bit too rich for us after almost 7 weeks of travelling. We came back on DFDS to Dover and drove straight back home with only 2-3 very brief stops. It was a great trip. We didn’t see a single migrant/refugee. And we did 6068 miles in 48 days. Phew! That’s a big thank you to Martin who drove almost all of the time. You can see all of the pictures for this part of our trip here.